Palestine is a country where the colours orange, red and yellow blend together. Offering ancient biblical sites, the land is deemed as sacred by many groups, and proves a very interesting place to visit. 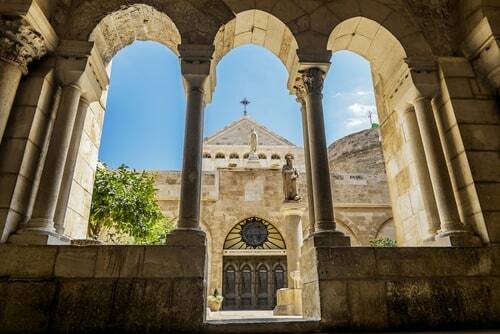 For sweeping views of the territory, making the ascent to the Mount of Temptation Monastery is well worth your time. To explore further, stop off at the Qumran Caves, or The Church of St. Catherine to glimpse some stunning architecture and to immerse yourself in the local culture. The cuisine in Palestine is influenced by Persian culture and Turkish cuisine, and includes delicacies such as Sfiha – a flatbread with lamb and cooked peppers or tomatoes. Try sweet pastries during the evenings of Ramadan, one of the most interesting periods to visit. There’s also a risk of poliomyelitis. Healthcare can prove very expensive in Palestine. You must pay Hospitals directly, so make sure to bring sufficient funds whilst travelling. You should also purchase medical insurance which covers medical repatriation. There are pharmacies available in Palestine but always travel with a well-stocked medical kit and any prescriptions you may require. In order to access an emergency medical service, dial 101 for the Palestinian Red Crescent Society. Is Palestine Safe for Travel? Government information on safety and security is not currently available. While visiting Palestine, make sure you stay safe. Always keep an eye on your belongings and carry a copy of your passport rather than the original. Be wary of tourist traps and take the safest means of transportation possible. Finally, take care of your health by reducing exposure to bacteria and animals or insects. Palestine and Israel have been in conflict for many years. Be wary during your travels. Do I Need a Visa to Visit Palestine? Prior to travel, make sure you check with your transportation company about any passport requirements to travel to Palestine. This is important as in some cases their regulations on passport validity may be more strict than those of the destination country. There is currently no information on an embassy in Palestine, you may always call the Emergency Watch and Response Centre in Ottawa in case of embassy related issues.